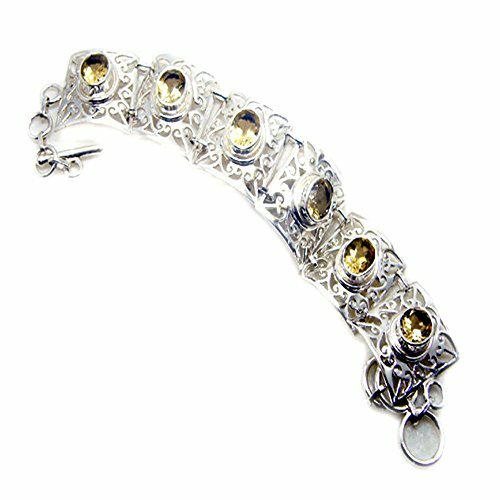 Natural Citrine 925 Silver Bracelet For Women November Birthstone Bangle Toggle Clasps Length 6.5-8 Inch by 55Carat at SCRHI. MPN: 55CTCTRBRC41-6.5. Hurry! Limited time offer. Offer valid only while supplies last. HANDMADE: Natural Genuine Citrine Bracelets Handcrafted Indian jewelry. Excellent Astrological Chakra Healing Birthstone Bracelet. CONTACT US : If you have any queries contact us please post into "Customer Questions & Answers" below the "Product specifications". If you have any questions about this product by 55Carat, contact us by completing and submitting the form below. If you are looking for a specif part number, please include it with your message.